In my journey towards a greener beauty routine I've been going for a natural-ish approach. My rough rule-of-thumb is to try to avoid endocrine disruptors and go for natural formulas whenever possible, especially for anything I use over large areas of skin that's absorbed like moisturizer, skincare, lip balm, and so on, but I wouldn't stress out too much if I occasionally strayed into conventional products, especially when it came to colour cosmetics and cleansers. That said, I've been curious about natural shampoo and conditioner for a while. Do they really work? Are they worth the hype? Would they be as effective as what I could buy at the drugstore or salon? 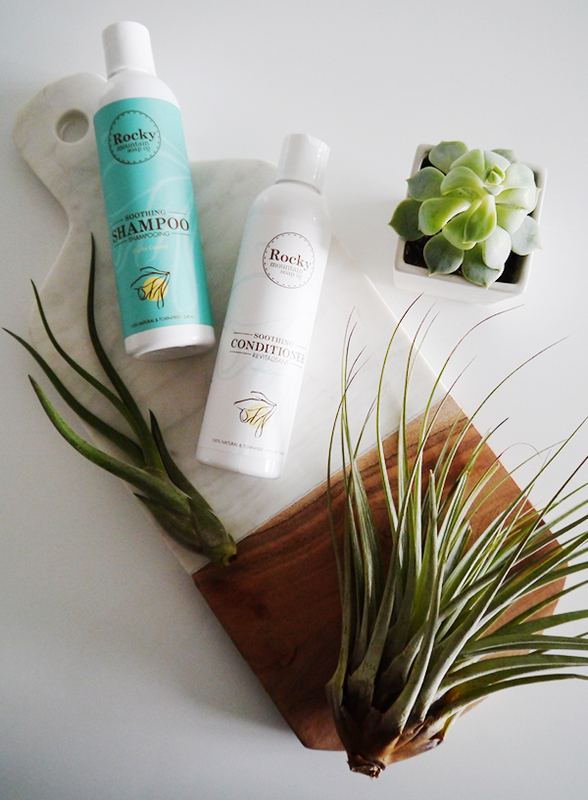 I got the chance to find out firsthand when Rocky Mountain Soap Co. sent me their Soothing Shampoo and Soothing Conditioner ($15.50 each) in the vanilla coconut scent. Conventional shampoos and conditioners can contain any number of worrisome ingredients, the most notable of which is probably sulfates. Sulfates are an inexpensive and highly effective surfactant, which means they create suds that lift away dirt and oil very well, but they can also be incredibly drying and irritating. What's more, there is some concern that sulfates, if not manufactured properly, can be contaminated with the carcinogen 1,4 dioxane—and there's no way to tell whether that's the case with your shampoo or not. 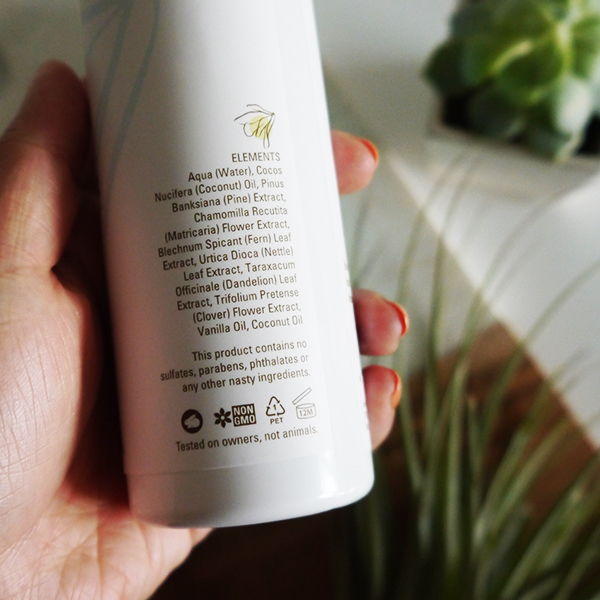 Aside from sulfates, conventional shampoos and conditioners can also contain parabens or pthalates, both endocrine-disrupting substances; methylisothiazolinone and methylchloroisothiazolinone, artificial preservatives that are also potential allergens; artificial fragrance, which can be any number of chemicals as fragrance is considered a trade secret and doesn't have to be disclosed; and silicones, which are harmless in and of themselves and can smooth strands and give them a shiny appearance, but can also weigh hair and scalp down with build-up. Of course, just because you use something on your hair and scalp doesn't mean it's absorbed directly into your body or your bloodstream—we've already talked about how skin doesn't work that way and hair, which is dead matter, even less so. Plus, shampoo and conditioner get rinsed off and down the drain anyway; in the 1-3 minutes it's actually in your hair it's highly unlikely to be absorbed. However, if you have environmental concerns about the toxicity of the ingredients in conventional shampoos and conditioners, or if you've noticed allergic or sensitive reactions to what you currently use, then natural formulas may be something to consider. 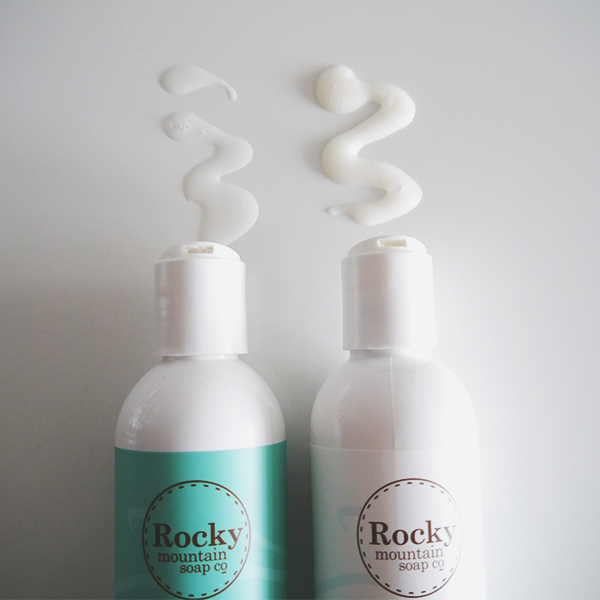 I once had the pleasure of meeting Rocky Mountain Soap Co.'s Karina Birch over a beauty blogger meet-and-greet dinner, and she likened Rocky Mountain's formulas to Italian cooking: simplicity and effectiveness achieved with the fewest ingredients possible, but always of the best quality. The ingredients lists of the soothing shampoo and conditioner certainly reflect that. None of the worrisome ingredients I listed above are to be found here. Instead, the shampoo relies on potassium cocoate and glycerin to cleanse; pine, chamomile, fern leaf, nettle leaf, and dandelion leaf extracts to soothe; apple cider vinegar for a squeaky clean and shine; and vanilla and coconut oils for natural, divine-smelling fragrance. The conditioner's ingredients list is pretty similar, but without the surfactants and apple cider vinegar and with the intensely moisturizing benefits of coconut oil. The biggest mistake a natural shampoo newbie can make is using too much, thinking that the shampoo isn't working because there are no suds. There are even unhappy reviews on Rocky Mountain's website where customers have complained of draining half a bottle at a time. Don't do that! 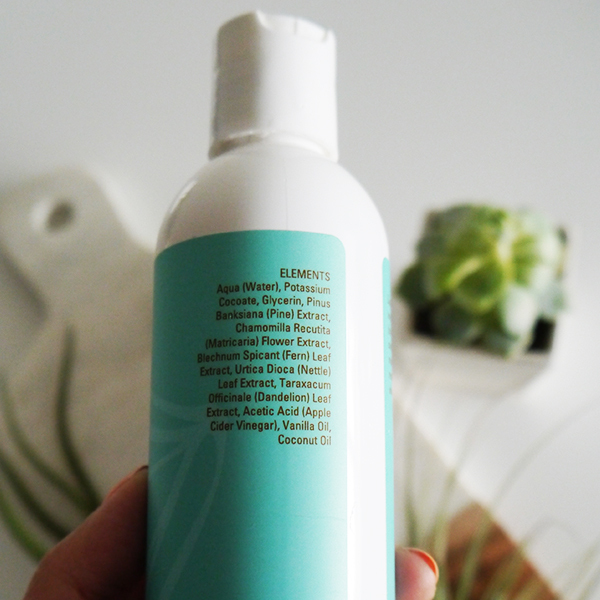 The first time I used the shampoo, I did find that it didn't lather as well, but that's down to the sulfate-free formula and the fact that it was stripping out all the keratins and silicones and weird polymers my other shampoos were leaving behind. After that first time, I've found that it creates more suds with hair that's been stripped "clean." Personally, I need a bit more product than the recommended quarter-size dollop because I have oily roots and thick hair, but if the shampoo is having trouble lathering you can try wetting your hair more or rinsing out the first shampoo and doing a second one—either one will do the trick. Just don't go draining half the bottle and complaining that it doesn't work. Because the Soothing Shampoo is silicone-free and rinses away cleanly, the ultra-moisturizing Soothing Conditioner really has a chance to sink into each strand and make it shiny and soft from the inside out thanks to the coconut oil in the formula. In fact, the texture of this conditioner is so rich, creamy and nourishing that you can probably use it as a hair mask too. I used to do hair masks and deep conditioning treatments regularly, but ever since I started testing the Soothing Conditioner I've stopped—leaving it in my hair and rinsing it out at the end of my shower is enough to keep it shiny and healthy-looking. Both the shampoo and conditioner also get extra points for the natural vanilla coconut scent, which is so delicious in the shower but fades away within half an hour and isn't overwhelming or cloying. Results-wise, the Soothing Shampoo and Conditioner left my scalp and hair feeling soft, clean, healthy, and free of build-up, but it didn't do anything beyond that. If you have fine hair, it won't act like a conventional volumizing formula with a lot of polymers, bulking up the space between strands and performing amazing, practically architectural feats. If you have thick, coarse, or frizzy hair, it won't smooth down the hair follicle as much as a keratin- or silicone-laden formula will and give you that incredibly groomed, fresh-from-the-salon polish. After weaning myself off of drugstore shampoo and conditioner, for the first time in what must've been years I saw what my natural hair texture was like, and although it was fine...honestly, I kind of missed the salon-esque polish and better body that my other shampoo and conditioner delivered. 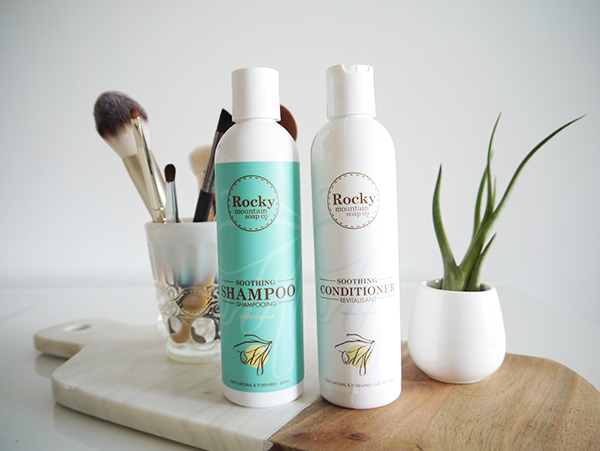 After weighing the pros and cons of each, I've decided that I'm okay sticking to my normal shampoo and conditioner and using the Rocky Mountain ones as a clarifying change-up once every 1-2 weeks. Rocky Mountain Soap Co.'s natural shampoo and conditioner may be for you if you have allergies or sensitivities to conventional hair care products; you have environmental concerns about certain ingredients; or you demand nothing more from your shampoo and conditioner than soft, clean, healthy locks. This stuff really works and it doesn't leave any hair or scalp build-up. But if you require more transformative effects from your shampoo and conditioner, you might need to look elsewhere.